I know that I haven’t been around much lately. It’s mostly called anxiety and stress. Yet another word for it is fear. All that and then my computer died. I mean like reeeeally died. For a number of years I have relied on Pete. Pete is my oldest son’s very good friend. He was even Best Man at my son’s wedding. Pete has graciously allowed me to call him in panic times with my computer even when I lived back in New Jersey. So it came as no shock to him when I called and said that I had the blue screen of death. Circumstances were such that he dropped what he was doing and came to my home. I think most of why i went ahead and charged the new computer was because, since it was windows 7 (yuck) I thought it would help keep my mind off of the anxiety and stress stuff. Unfortunately, I can’t say it’s done that. And I am still learning my way around windows 7. Can’t say I like the changes to my programs..even this Live Writer I use to do my blog posts now does not give me the option to bring in pictures from the web. I don’t want to use them from my computer for the reason which just happened ..if the computer crashes the pictures go bye bye. I am not even sure I am doing the pictures so they will stay. yup, I know I am old. I know i hate changes. and I will say, the older i get the harder it is to relearn things. It’s always been easier to learn “new” then to relearn a different way. So now I have the new computer… getting around much slower than before.. but the anxiety and stress are still huge. And so my reading has darn near bit the dust. I am lucky it I read 10 pages a day. My camera is hardly picked up these days. It seems no interest can conquer my problems at the moment. Anyway… here I tried using the camera (of course had to learn how to put them on the new computer which upsets me more) and then having trouble with live writer not showing me a way to get the photo’s here *from the web* and not my computer. But I did it somehow, don’t even know if I will remember how to do it again.. You’d think I’d feel good about somehow managing to do it ..but I don’t. I hope you can bear with me, i want things the way they were..just don’t know if my head will get back there. Below is Pete. Without him I’d have fallen to pieces . I will never be able to thank him enough…. never. Where does time go? ..and why does it go so dang fast?! Boo Boo Kitty wakes me early (about 5 am) . This is nothing new, he's always done this. And so, I always wake in the dark of the morning. Of course, now that *Fall* about to be here (not that one notices in southern Florida), I have noticed that daylight is getting later and later. ..and I know when we first turn the clocks back, for a short time, daylight will come earlier. And naturally it follows that the dark of night comes earlier. Sigh. Where does time go? ... and why does it go so dang fast?! Trying to understand or explain the passage of time is impossible. It's like telling someone what a certain pain feels like. They nod their head in understanding and say yes, yes, yes I know how you feel. And one day they get that exact same pain and what do you hear? "wow, I didn't know it would be like this!" Understand?.. *sigh* Until it happens to you, you really don't understand at all. How do you tell someone to make a serious Bucket List .. hang it where you will see it every day, add to it or take away from it but don't forget it. And each year MAKE yourself do one of the items on the bucket list..... because saving and waiting isn't going to help you do it. If anything it will take away from the chances you might have of finding those happy moments. Yes, it's stopping to smell the roses. Because when you are older your health may (may? more like will) be a hindrance.... along with more excuses than you can shake a stick at. I can promise you that no matter how many things you may do on those bucket lists.. it won't be enough. But they will make you feel that you enjoyed life a little more. And then the day comes when you wake up and find that you are ON the fast track and there's no stopping time... and you know exactly where the train will stop. When life suddenly picks up speed and you find yourself, not just saying but feeling, where did the months and years go? When did my kids grow up and no longer need me? I was just 28 wasn't I ? How did I get old without seeing it? Why did I miss so much? Where does time go? ..and why does it go so fast? I think I need to end on a happier note... possible? hell if I know! I have totally fallen in love with David Goode's bronze statues. I've shown a photo of one before and left his link... but I can't get his work out of my mind. Most of them are happy Elves! Just look at the expression in the statue above's eyes! He's lookin' to get into some serious mischief ! I find myself wondering how does David Goode's mind work? What made him make so many Elves? Is he even half as happy as his work portrays? I want to live next door to his store and just go and sit among the Elves all day long! Oh yeah, this one above is up to no good! heh. I really love this one... if it's possible to love one of these more than another! ..Just look at the contentment!!!! How does he get such detail? Where did he get these exquisite expressions? This one too belongs in my apartment! This last one I will post surprised me. I did read Mr. Goode's biography and he's my son's age! So I wonder ..where did he see this fairy holding a Jack-o-lantern? Because he's too young to remember Jack-o-lanterns growing wild in some field! Of course maybe England still has more fields than we do here in America and they still are plentiful there. Seeing that Jack-o-lantern brought back memories of when I was quite young (single digits!) There was a field next to where I lived and I always would go there to look for wild strawberries or wild Violets to pick for my mother or... to find jack-o-lanterns! When Jack-o-lanterns loose their pretty orange color they become a beige color and nearly transparent.. they make a great piece for dried flower arrangements. Anyway... back to Mr. Goode. I want to go to England and live next to his store and each day I will go in there and stay with everyone of his creations because they make me feel good inside. I envy Mr Goode for his creativity and for what he must feel inside as he makes all those smiling faces full of thoughts of monkey business! Well.. first let me say that this is most assuredly a perfect book for RIP! It began innocent enough.. there was a murder and a Sergeant on the police force on the case that had the audacity to want to discover more of the murder...even if it was a murder of a nobody. Then the book jumped to Sergeant Quire's stint the the military service and I momentarily got confused. (this is easily done when you are my age or older) But then It quickly began to get interesting. Then because he won't give up... he gets fired. Now, normally I am not a find a murder and a detective searches for clues and finds the murderer type of reader.... but then again this one didn't quite go that way either. There was a hint of *something not right*. There was a hint of *something like Frankenstein?" There was even Burke and Hare! Who began their business by stealing bodies from graves...and then stepped up to murdering victims so that they would have a body to sell! (I still want the movie of Burke and Hare!!).. anyway.. Most of all there was one *hell bent* ex-sergeant who was going to solve all the weirdness and murders. Even when the dead came after him! How does one kill a dead person you ask? Guess you will have to read the book to see *if* it is possible. So, although this was not quite my cup of tea... it was written very well and the story moved along nicely so that one did not get bored and even though some things become painfully clear..you still needed to read on to see how it all ends! I think this book will be liked by many as a very good read for RIP. Amazon Best Books of the Month, June 2011: As a kid, Jacob formed a special bond with his grandfather over his bizarre tales and photos of levitating girls and invisible boys. Now at 16, he is reeling from the old man's unexpected death. Then Jacob is given a mysterious letter that propels him on a journey to the remote Welsh island where his grandfather grew up. There, he finds the children from the photographs--alive and well--despite the islanders’ assertion that all were killed decades ago. As Jacob begins to unravel more about his grandfather’s childhood, he suspects he is being trailed by a monster only he can see. A haunting and out-of-the-ordinary read, debut author Ransom Rigg’s first-person narration is convincing and absorbing, and every detail he draws our eye to is deftly woven into an unforgettable whole. 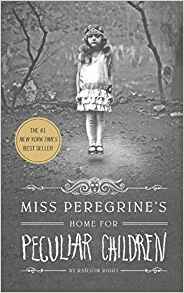 Interspersed with photos throughout, Miss Peregrine's Home for Peculiar Children is a truly atmospheric novel with plot twists, turns, and surprises that will delight readers of any age. From the moment this book was in my hand... it felt different. A little smaller in size than some, but firm. I flipped the pages and felt the paper. A much better quality of paper than most, the lines are 1.5 spaced instead of single spaced, and the size font was readable. Add to that all the pictures that were in the book! Pictures and or illustrations I love when they are in a book. The book even has fancy page numbering at the bottom... this book was done right! Why can't more books have this much love put into them along with the story?? Ok .. so all looked great, now I had to hope the story was as good as the book looked... it was. From the first sentence in the prologue: I had just come to accept that my life would be ordinary when extraordinary things began to happen. The author caught my attention... and quite easily kept my attention through the entire book. This is a perfect book for RIP, so if you haven't read it.. you well might want to add it to your list because I don't think you will be disappointed. Jacob's story is quite amazing. When he was young, one might say that his Grandfather tried to prepare him...but how does one prepare for what one does not believe in?? Surely, a person can not really float up into the air. And surely there is no such thing as being invisible. Is there? When the time comes that Jacob no longer thought that his grandfather was crazy is when Jacob's adventure begins. Once it begins you are have to keep reading to see what's next. I have to say that the only disappointment in the entire book is how it drops off suddenly to set it up for the "next book"... it's pretty blatant, and hard to miss, and although it doesn't leave you with a *cliff hanger* it was just a tiny bit disappointing. I guess I am used to either having that cliff hanger and thinking *how can they do that to me?!!! argh! * or, the book being more completed but yet knowing another adventure would be in store. However, I will say that the ending does not deter me from saying this was a very enjoyable book and that I think anyone who reads it will totally enjoy it too. 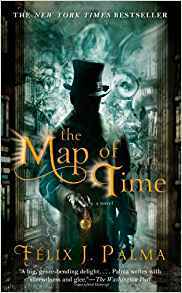 The Map of Time by Felix J. Palma. Right off the bat I am going to admit that the cover had me on this one. The fact it was in England in Victorian time was the second grabber. And then Mr Palma uses names that are known to us all such as H.G. Wells, Jack the Ripper, Bram Stoker and Henry James. It seemed to have everything that a great book needs! However........... the book began slowly, and after 50 pages I wondered if I should go on. 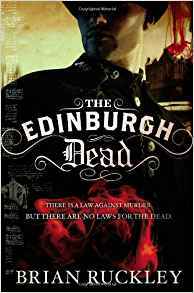 The beginning should have been the grabber, seeing as it was about Jack the Ripper... but the style of writing just wasn't making me feel like I was in the book. The book is laid out in 3 parts. Loosely connected it's almost 3 separate stories..again, that did not thrill me. Over all I will say that I didn't just put it aside I read the whole book, and considering that the book was 624 pages long, that has to mean it wasn't all bad. I'm sure others will love the book much more then I did . I even googled this book for reviews and it seems I am in the minority and most really like the book.. so.. there you have it lol.. sorry I am not much help on this one! So goes my first book for RIP.